SERIES PS by MOON Cutter Co.
Made with a standard keyway. Sides are ground concave to a hub for clearance. 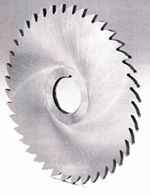 It is recommended that these saws be revolved by a key extending into the collars on both sides. All Moon Cutter Company products are made in the USA.